You'll be £25.00 closer to your next £10.00 credit when you purchase A Scots Grey at Waterloo. What's this? William Clarke of Prestonpans, Scotland, joined the 2nd Royal North British Dragoons, the Scots Greys, in 1803. Clarke had risen to the rank of sergeant by the time the regiment was ordered to Belgium on the news that Napoleon had escaped from Elba. Forming part of what became known as the ‘Union’ Brigade, the Scots Greys played a key role in Napoleon’s defeat at Waterloo. 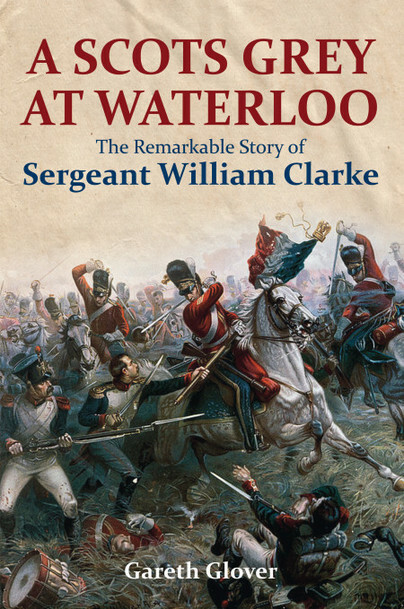 The John Rylands Library, Manchester, recently acquired William Clarke’s 600-page, hand-written memoir describing his enlistment and military career, the highlight of which was the Waterloo campaign, which he describes in unusual detail in the vernacular of the day, presented and annotated by the renowned historian Garth Glover. Thanks to this rare discovery, the reader can follow the movements of the Scots Greys at every stage of the action throughout the three days from Quatre-Bras to that climatic encounter on the Mont St Jean. Clarke naturally portrays the charge of the Union Brigade in dramatic and heroic terms, but he claims that the man who led the charge, Major General William Ponsonby, was killed by a musket ball and not cut down by French cavalry, as is usually stated, for recklessly charging too far. After the battle, Clarke was part of the Burial Party. He then graphically describes the sad scene as he does the trail of the defeated French army as the pursuing Prussians cut a merciless path on their way to Paris. A Scots Grey at Waterloo provides the reader with an exceptionally in-depth account of the actions of the cavalry at Waterloo that will mark this memoir out as one of the most significant to have been published in the last 200 years. The discovery, recognition and publication of an important manuscript are to be applauded. I highly recommend it.